First of all, many congratulations on your engagement, and if you’re thinking of celebrating in style there’s no better way than dancing the night away alongside your family and friends at your engagement party! Engagements are a time to be celebrated and what better way than to have an engagement party disco? An Engagement party is less formal than the actual wedding plus it gives you time to checkout the DJ in action before you book them for your wedding. One of the best things about an engagement party is you get a look at what it will be like on your wedding day, such as being the centre of attention, giving and delivering a speech or two and maybe giving away a few gifts for the people that have helped you organise your event. In order to ensure that we create the best engagement party, we set up a personal and secure on-line planner so that you can give us details about your evening and tell us what music you would like played at your party. We love hosting parties and with our interactive entertainers and your music selections, you can be sure of an amazing celebration. Hopefully you will book us for your wedding too! So you’ve recently proposed to your future husband or wife, or just got engaged yourself. 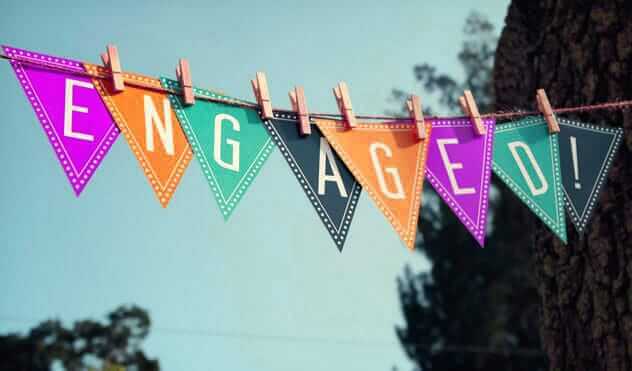 Why not celebrate your recent engagement with a party for friends & family? We can help you celebrate your engagement – you can both specify the kind of music you’d like to hear, and are more than welcome to make song requests prior to your celebrations. Maybe there is a special song that you’d like me to play for you – we would only be too happy to accept. Another great way to make and capture memories is by booking our Photo Booth. If you would like to discuss your requirements for your Engagement party in more detail, then please contact us for more information.